Hailing from Irwin, Rachel is the daughter of Rowly & Deb and sister to Sarah. A 2007 graduate of IKM High School she earned a Bachelor's degree in Agricultural Education with a minor in Animal Science from Iowa State University. She was a member of the Iowa High School Rodeo Association, and 4-H. At Iowa State she was active with the rodeo club and a member of Pi Beta Phi Sorority. 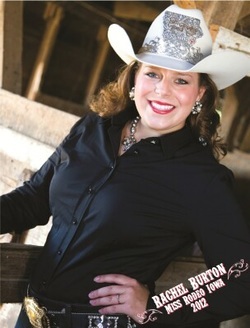 Prior to earning the 2012 title Rachel reigned as Miss National Federation of Professional Bullriders and earned first runner-up honors at the Miss Rodeo USA Pageant representing the organization. She also held the title of Miss Teen Rodeo Iowa.